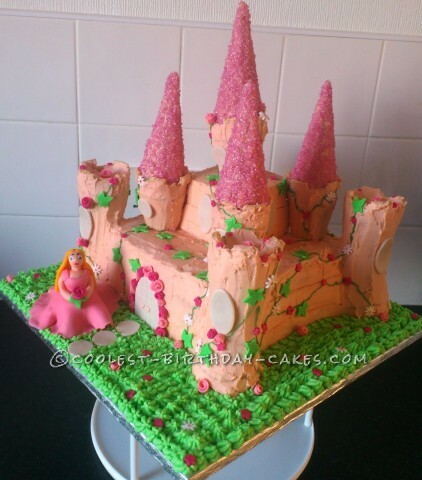 A cake fit for a 4 year old princess my friend said….mmm where do I start? OK, I loved making this princess castle birthday cake, although when it was finished it was HUGE, well bigger than I anticipated! I covered it in butter cream I had colored with pink food gel, and I’m no professional but from scrolling the net a lot of people mentioned using cones for the towers, so I used ice cream cones for the top coated in pink edible sugar glimmer and ice cream cups for the sides one upside down and the other on top, then coated these in the butter cream. The fun part was making it come alive…..adding the windows, door, flowers and leaves over the walls. I made the princess out of fondant, this was a bit tricky as I have never made a figure before, improvement needed but it was OK for my first attempt. Overall I was pleased with the finished cake but practice makes perfect so I’m going to keep trying!